We love North African Sage from the higher elevations of Morocco it performs beautifully in our climate. A rosette of low large sage green leaves is your first clue that this is a cool species. In summer 4′ spikes in whorls of blue and white flowers are spectacular. The blooms last a long time (6-8 weeks) and are awesome for cutting and including in huge, wild flower arrangements. Forms large clumps in time and there will be more and more flowers. Full sun, rich, well drained soil with regular summer water to establish after which light to little summer water is necessary in our climate. Very easy to grow and cold hardy. May self sow in open disturbed sites. 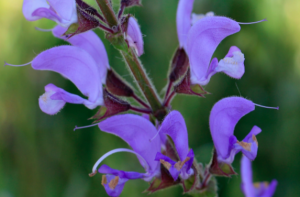 Great Salvia but surprisingly difficult to find.